From: Lollypop Farm, Humane Society of Greater Rochester, Fairport, N.Y.
Sheryl wrote this tribute to Grace after she said goodbye to her on May 21. Since then, Sheryl has added another adopted dog to her family. 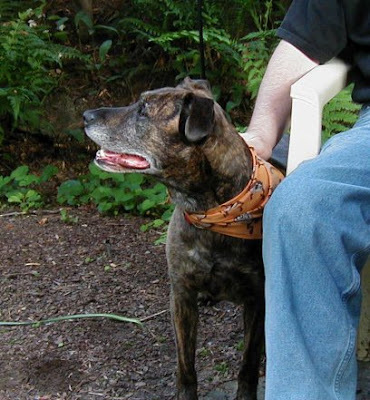 I first met Grace, a pit bull/greyhound/Lab mix, a little over 10 years ago at Lollypop Farm, a local animal shelter. I was shopping for a new dog about a year after I lost my first husband and my old German shepherd, who followed him shortly after. I almost missed her—she was huddled in a frightened little ball in the corner of her cell. I visited with each dog there, trying to discern compatibility in two-minute visits with each. On my second pass, she uncurled a little and looked up, so I decided to take her for a walk to see how she responded. I led her outside to the back of the shelter, and she walked with her head down and tail between her legs. She never looked up nor gave any reaction. We went to a room where I could take her off the leash, and she stood in the corner in the same frightened stance. When I called her she came to me slowly, and I could feel how tense she was. I began to wonder if this dog had any life left in her. She was only six years old but acted like an old woman. The shelter volunteer suggested that we take her outside into a courtyard they have there, so we could see her outside off the leash. When let free, she skulked to the other side of the small enclosed space, then she started sniffing around. Apparently she found something that interested her, because for the first time she lifted her tail up and began a small wag. Seeing that, I said to the volunteer “I’ll take her!” I was smitten already, I guess—I was only waiting for a sign to push me over the edge! The volunteer, knowing the poor show Grace had put on previously, asked me “Are you sure?” Yes. Filling out the paperwork with Grace lying beside me, several volunteers came up to me and said, “Oh, you’re taking Grace? We love her! She’s our favorite!” Any doubts I might have had in the back of my mind quickly dissipated. The first few months we lived together were, to put it mildly, interesting. The intake papers from the shelter stated that she had come from a family with two small children, six months and two years. The reason for turning her in was that the children were abusing her. This didn’t jive with the fact that she acted interested in kids but was frightened of men. It was quite obvious to me who the abuser really was. She also seemed to have been trained to attack other dogs, as I found to my dismay when walking her. He told me she had jumped on the fence several times, and seeing that didn’t work, she went over to where the fence meets the house and jumped up again, but leaned her body on the house to support the bulk of her weight, then used all four paws to propel herself up and over. I made it clear to Grace that I was not happy with this behavior. Fortunately for me, she had made it her mission in life to do whatever pleased me most. This is actually a trait with pit bulls more so than other dogs, I have since learned. Her relaxed, languid demeanor instantly took a complete about face, turning into a look of horror and a rapidly retreating dog who was running as fast as she could. I called her back, laughing, but somewhat horrified myself. I wanted to find whoever had done this to her and beat him with a stick, too. Over the years Grace learned to trust again. I remarried, and she loves Earl almost as much as me. There’s nuttin’ like the mama, though. We have “danced” and played our own made-up games together countless times. When I would come home and she came out to greet me, she would run and run and run and run in circles around the yard, she was so happy. She was known in the neighborhood as that dog that runs in big circles, but never goes in the street. She has graciously put up with our cats, one of whom thinks Grace is her own personal dog. Rosie rubs up on her, walking beneath her chin then weaving back under her body, purring madly. I’ve never seen a cat so devoted to a dog, and it was love at first sight for Rosie. A couple of years back, Grace started slowing down. The dances got shorter, the circles got fewer. She started losing weight, and we wondered if she’d make it through the winter. She did, and another winter on top of that. She had been in kidney failure during this time, and was forced by her mean mommy to eat nasty prescription food that she didn’t like. In the meantime, the arthritis got to the point where medication was in order, then more meds on top of that. Three prescriptions and one prescription diet later, there were times when I could tell she was still in a lot of pain. I spoke with the vet about when knowing when it is “time,” and she said that if I wait until it’s obvious, then I’ve waited too long. She stated that when the bad days start outnumbering the good days, then I need to make that decision. The last prescription she was on for pain actually was making her kidneys worse. I was told that I needed to take her off the pain meds to slow the kidney failure; however, they also told me that there was no type of medication that could replace it. As this was the only pain med that actually seemed to make any sort of difference, I made the decision to keep on giving it to her, as I could not sentence her to that painful existence, even if it meant speeding up the kidney failure. A month or two back, she fell down the stairs from midway down. It turned out that this was not an isolated incident, as it was repeated several times. I was afraid that one day I’d come home to find her with a broken leg at the bottom of the stairs, so Earl and I talked, and we started to accept the fact that the end was growing near. When the prescription food ran out (which she didn’t like but ate because it was the only food available), I bought her favorite kind. I gave her treats that she hadn’t had in over a year because she’d been on a low-protein diet. I fed her ham with her pills. Last night she had fish for dinner. When those bad days started outnumbering the good, I made the appointment, and it was kept this morning. We were with her to the end, which I think is only fair. I don’t understand how anyone could possibly abandon their pet to strangers in their last moments, no matter how compassionate those strangers are. For all the joy that she gave me, I owe it to her to be with her through the end, even if it is hard for me. It actually would be harder for me knowing that she was alone and frightened. I experienced that a few years back when she jumped through a screen window at a friend’s house where she was staying for the weekend while Earl and I were out of town. She was lost to me for 24 hours, and I have never been more anguished in my life—wondering where she was, was she hurt, frightened, dead…? Thank goodness a kind stranger picked her up and reported finding her to the local authorities. I am going to miss the hell out of that dog. She gave me more joy than I could ever have imagined. My only regret is that I didn’t have long enough with her; I feel cheated that I missed her first six years. I’m so happy to have been able to give her the life that she deserved, after she had such a rough start. I think that having experienced abuse, she was grateful to experience the good life. I truly encourage anyone who has any thoughts of getting a puppy, or buying a purebred or designer dog, please give thought to that grown-up mutt who is languishing in the shelter. They have so much to give, and are so often forgotten. You may receive so much more than you give. Oh, what a pretty girl Grace was.